The team at Emmi Dental Associates here in Wilmington offers a diverse array of dental care solutions to help patients have beautiful, dazzling smiles. One such solution that is used time and again is porcelain veneers. Porcelain veneers are a versatile cosmetic dentistry solution, able to give patients the perfect, pristine smile of other dreams. We'd like to take a moment and look at candidacy for porcelain veneers right now. Good candidates for porcelain veneers are people who suffer from various cosmetic issues with their teeth. They should be in otherwise good dental health in general, and their teeth should be healthy enough to support a porcelain veneer when it is in place. Usually a small amount of tooth structure (less than a millimeter) is removed in order to accommodate a porcelain veneer. It's important that patients also have realistic expectations about the nature of the porcelain veneers treatment and be committed to good dental hygiene in the years ahead to make their smiles look their best. If you have a tooth that is slightly chipped or cracked in some way, the use of porcelain veneers can be a perfect solution to your problem. With a porcelain veneer in place, the chip or crack will be totally concealed and no one will realize that there's anything wrong with your smile whatsoever. 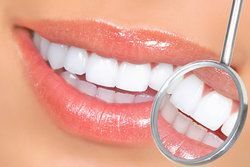 Teeth whitening treatment can work wonders for many people, but some stains are so tough that they just will not respond to teeth whitening treatment. In those cases, the ideal option for enhancing the brightness and whiteness of your smile is a porcelain veneer. Mask those major stains and keep your smile looking great. Porcelain veneers are sometimes referred to as "instant orthodontics" because of the kinds of results that can be achieved. That's not overstating it, either. Minor gaps, small misalignments, and any sort of crookedness that is cosmetic in nature can easily be addressed through the use of porcelain veneers. Just a single veneer can mean the difference between a crooked smile and a perfect one. Smile makeovers are combinations of different dental treatments that help improve the overall appearance of the mouth. Since porcelain veneers are so versatile, they are a common part of smile makeover treatment. In some cases, a full smile makeover can be achieved just by using porcelain veneers alone. There will be some cases in which porcelain veneers may not be the right solution and more conservative treatments such as teeth whitening and dental bonding might be more ideal. Similarly, full orthodontic care might be recommended rather than instant orthodontics. During your consultation process, we will be more than happy to go over your various treatment options in full detail. For more information about porcelain veneers and how they can help you achieve a more beautiful smile, it's important that you contact our cosmetic and restorative dentistry center today. At Emmi Dental Associates, we will be more than happy to help you with all of your aesthetic dental care goals.